If you set any store in old Slavic tradition and want to try getting the person of your dreams to fall in love with you, calendula might be your best bet… assuming that going up and talking to them doesn’t work. Maybe one day you decide to follow this special someone as they walk along a dirt path. Folklore would tell you to dig up the soil around one of their footprints, in a way that somehow doesn’t look suspicious, and bring it back home with you, where you should plant it in a pot with some calendula seeds. If all of this does what it is supposed to do, the person in question will fall madly in love with you. I’m in no way the sort of person who get’s all hot and bothered about flowers or gardening, but calendula’s history is pretty neat. This isn’t some formerly disregarded herb that a few hippies suddenly decided must be the cure to every ailment under the sun. Calendula has been an important part of medicine for, quite literally, ages. Archaeologists have found cuneiform tablets from the 7th Century B.C. that show the flower being prescribed as medicine and it has since been used by everyone from the Ancient Egyptians to American Civil War medics. Aemilius Macer, a 12th Century herbalist, even recommended just staring at the plant to improve your eyesight and clear the head of a bad mood. As a cooking ingredient, calendula was often called “poor man’s saffron” as it gave food the same yellowish colour as the extremely expensive spice, also with a similar flavour. The added bonus was that calendula is an effective treatment for many stomach and bowel issues, and grew so frequently and widely that it was relatively cheap. The deeper you go down the rabbit hole of calendula’s history, the stranger the stories and folklore. The French in the Middle Ages believed that walking barefoot on the flowers during the morning on a very specific day would grant someone who was pure of heart the ability to understand the language of birds. And Netherland mythology ties the flower to unicorns. 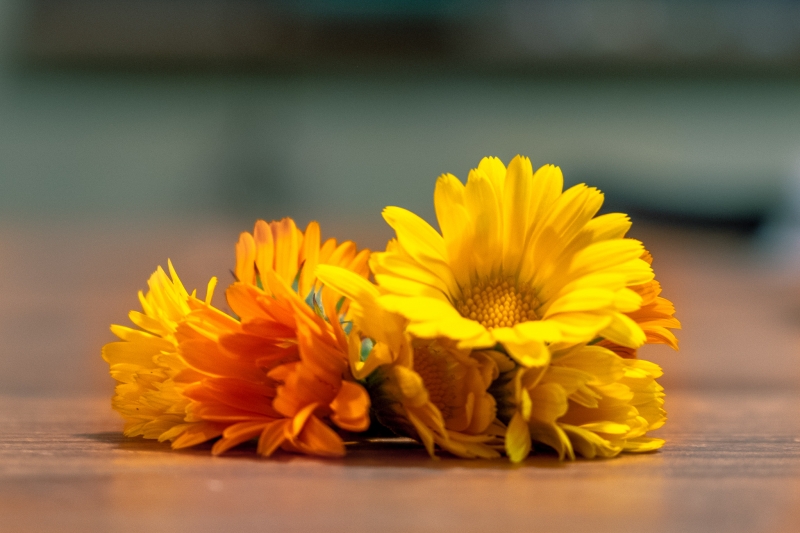 Depending on where you were and who you talked to, calendula could either signify love and purity or sadness and loss, and as it became more widespread, it’s uses and varying mythologies only increased. The Romans used a concentration of calendula to treat scorpion bites. Most other cultures made tinctures and salves from the flower which were used as anti-inflammatory and antibacterials to treat irritated skin, rashes, sores, stomach problems, fevers, bug bites… the list goes on. Calendula became very much a treat-all in terms of old school healing. The interesting thing is that many of its prescribed uses are still being held up by modern research. It is useful in the treatment of various types of dermatitis, especially radio-dermatitis, and is considered a class one topical steroid in the same league as witch-hazel. Patients undergoing postoperative radiation for breast cancer are recommended topical products with calendula. As a insecticide, calendula is about one third as potent as DEET and, for the same reasons, it is a viable treatment against dermatitis, does an excellent job of soothing bug bites, if the black flies make it through your first line of defences. We also recommend calendula for sensitive, dry and damaged skin; as a facial cleanser, to promote the healing of burns, wounds, eczema and other inflammatory skin conditions. There are definitely some uses for calendula that we cannot recommend. Obviously, staring at the flower isn’t going to increase your vision, though it might very well make you happier and give everyone around you a good laugh. Many healers of their time prescribed it for internal use after giving birth or during mensuration, which might have helped with inflammation but has since been shown to negatively affect the mensural cycle, and has shown uterotonic activity in vitro. Due to this, it is not recommended that you consume calendula while pregnant or lactating. At Savon Du Bois, we source our organic calendula, freshly picked from a selection of local farms, dry and infuse it ourselves to ensure none of the beneficial elements are lost. Especially when we are making body products which have real health benefits for our customers, freshness and quality are what count. Calendula is a key ingredient in most of our non-soap products, including our BeeWild Lip Balms, face serum, diaper cream, Tummy Balm, Ow-Ease Insect Bite Relief, and much more. We also put the petals in our Sunrise Over India soap bar, which contributes to its beautiful yellow colour. A core pillar of our philosophy at Savon Du Bois is bringing natural healing practices and ingredients into our products so that we can give people an experience which does not just smell good, but has tangible health benefits. Making Savon Du Bois a part of your daily lifestyle is making a decision to not cut corners when it comes to wellness and body-care, so that you can live a truly healthy and balanced life.